We are pleased to announce that our facilities building aka The Boathouse is now finished—and we are absolutely thrilled with it writes John Skinner. 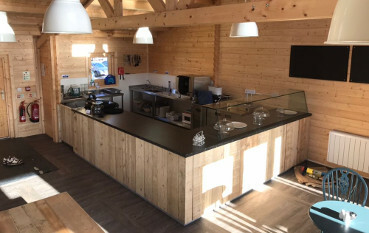 The fit-out did take longer than we had anticipated, but it has been well worth the wait, we are told, as we have ended up with a building that not just looks fabulous and feels fabulous, but one that is situated in such a superb spot that all the views are fabulous too. It now means that our boaters will have access to warm and clean showers, toilets and disabled facilities 24/7, which is what we have been striving for since we first applied for part funding from the European Agricultural Fund for Rural Development (EAFRD), the Rural Payments Agency (RPA) and the Rural Development Programme for England (RDPE) this time last year, and which we were successfully awarded at the beginning of this year. 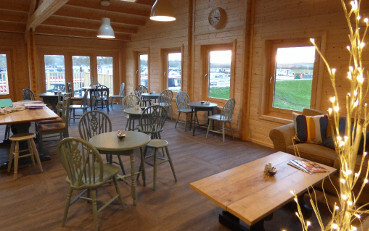 And the great news is that from the 1st December on Fridays, Saturdays and Sundays, Carrie Hewitt who has been making an excellent job of running the office over the past year, will be serving terrific teas and cracking coffees, as well as freshly prepared refreshments from our fabulous new boathouse overlooking the marina. Opening hours will be Friday and Saturdays 10am to 4pm and Sundays 10am to 2.30pm. Throughout the year we have been supporting the Multiple Sclerosis Society and thanks to everyone's generosity, we have to date raised a rather pleasing £940.00—so well done everyone. In addition, our Macmillan Coffee Morning at the end of September raised £342.10 which was great - nearly £100 more than last year, so our efforts are definitely going in the right direction. Many thanks to those folks who supported us once again, either by baking or by enjoying the baking! White Mills Marina is situated at Earls Barton on the Nene.